Feeling a little depressed, now that “hope and change” from the 2008 election has thoroughly lost its gloss? 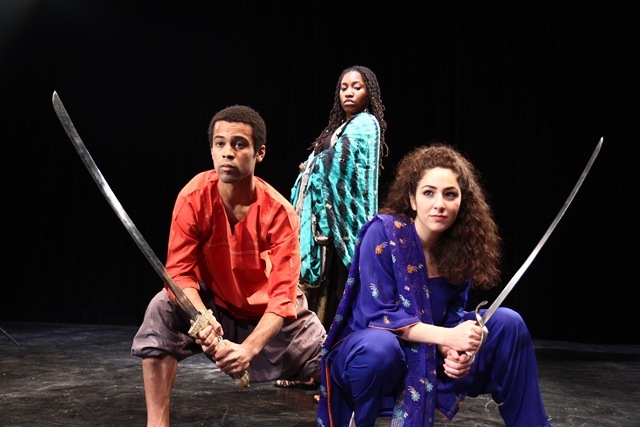 Head on over to Adventure Stage Theatre’s production, And a Child Shall Lead. Take a good look at young people fighting insurmountable odds to sustain creativity and to speak truth to power. Under the Nazis, from 1941 to 1945, the 18th-century fortress of Terezin, located in present day Czech Republic, was a nightmare place where youthful promise was meant to die. It was a transit camp where deported Jews either succumbed to starvation and disease or were shipped out to Auschwtiz, Majdanek and Treblinka. But Terezin was also a place where the Gestapo deported Jewish artists. Such a strong repository of cultured European Jewry yielded over 6000 hidden works of art created by Terezin’s children—hidden because any evidence of cultural creation or education at Terezin was punishable by death. 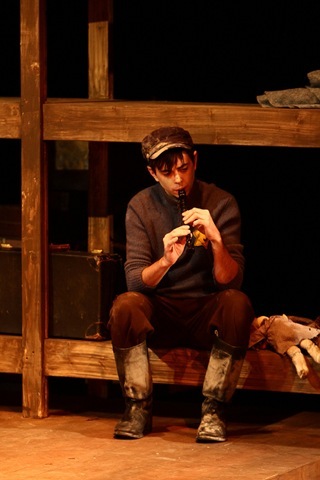 Michael Slade’s drama focuses solely on the child artists of Terezin. They draw, write poetry, stage puppet shows, play music and run their own newspaper. While mostly young adults take on child roles for the production, no adult character disturbs the world of this play. And a Child Shall Lead is meant for younger audiences but adults can also benefit from getting back to basics. 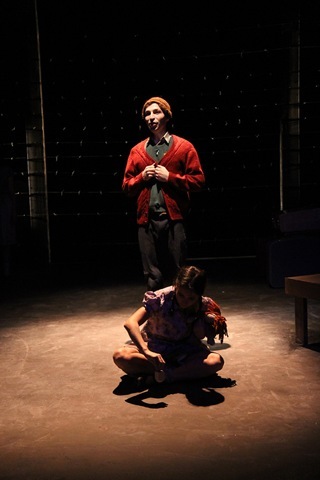 Just an hour into the play makes one realize the perennial nature of their struggle–simply to be heard, to have the truth told, no matter how terrible, and to create a vision of a better future worth surviving for. 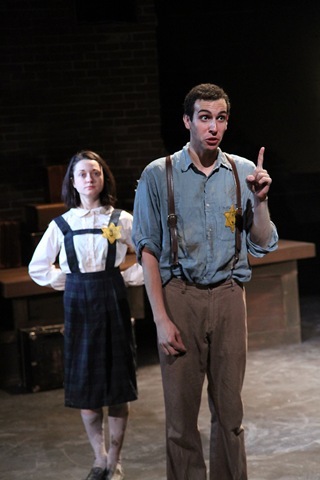 Unlike us, the child artists of Terezin carry out their mission under far deadlier and more dehumanizing circumstances. Heavy stuff for children’s theater; yet Director Tom Arvetis preserves the youthful drive and perspective of his cast through an energetic and rigorous pace of playing games: hide and seek, hiding from Nazi guards, hiding their artwork and newspaper articles in their own secret places, stealing paper from trash bins (because paper has been forbidden them) and carrying on lessons while a child stands lookout. 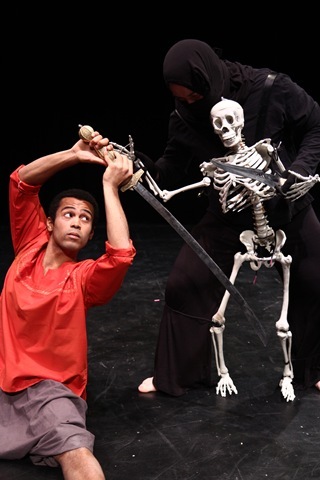 Even while portraying hunger, illness, and an ever-present terror of arbitrary execution, Arvetis’ cast brings excitement, suspense, and playfulness to their characters’ fight for survival, beauty and meaning. Play and preserving play in the midst of horror is this production’s most successful feature. Well-balanced scenic (Jessica Kuehnau), sound (Miles Polaski) and lighting design (Brandon Wardell) perfectly supplement and supports the action. Getting the truth out to others about the atrocities they endure proves far more overwhelming for Terezin’s children. The Third Reich showcases the city as the “Fuhrer’s gift to the Jews,” a place where they can be safe from the war. But, in reality, Terezin functions as a distraction from The Final Solution. The Gestapo produces a propaganda film about the city, complete with staged scenes of healthy and contented Jewish residents engaged in crafts. 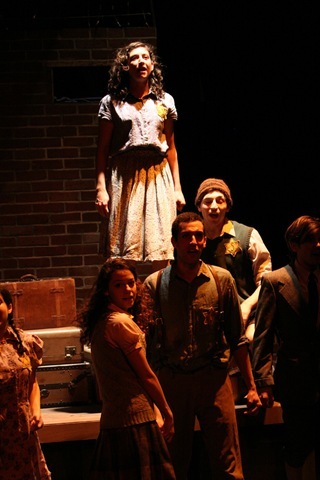 As the Red Cross visits Terezin, the children attempt to get their newspaper Vedem to the inspectors, but fail. All the Red Cross perceives is whitewashed Nazi reality. What endures from Terezin is the artwork and the bits of their newspaper. 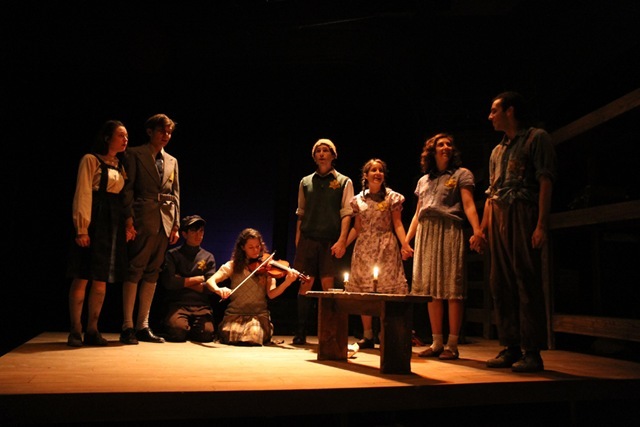 Death comes for nearly every character in the play–certainly, 15,000 children died in the actual ghetto. The production displays artwork copied from the artwork produced by the children of Terezin. Every poem recited is poetry that survived this awful place. While Slade’s play could benefit from a small amount of editing, no one can deny the emotional impact of his clear, simple and forthright work. It touches the primal core in us all and Michael Slade places our need for human dignity at the very center of childlike self-expression. Recommended for ages 11 and up (6th thru 8th grades). Adventure Stage Chicago (ASC) proudly announces their 2010-2011 season for young audiences, comprised of three thrilling plays making their Chicago debuts: a moving Holocaust drama, an action-packed magical adventure and a comedic physical theater event. Thirty miles outside Prague lies the city of Terezin, a Nazi-described "Jewish ghetto" and makeshift way station for millions of people awaiting transfer to death camps. Amid such bleak surroundings, a group of courageous children create stories, music, poetry, drawings, plays, puppets, and even an underground newspaper to craft a dream world of hope and beauty in a place where neither exist. 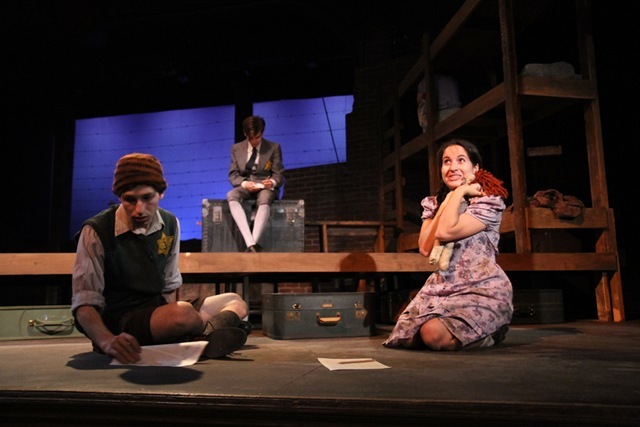 Incorporating actual poems and other writings recovered from Terezin after the war, this exquisite play explores the strength, optimism and extraordinary resilience at the core of the human spirit. Recommended for ages 11 and older. Evenings: 7:00 p.m. Friday, Nov. 26 only. Ittifaq, the pampered daughter of famed sailor Sinbad of the Seven Seas, bristles under her father’s overprotective care and longs for an adventure of her own. Young Sinbad, an orphaned porter, lives on the streets and relies on his clever wit to survive. The two meet by chance just before a bitter sorceress casts a poison cloud over the city of Baghdad. Rendered sick by the witch’s curse, the elder Sinbad bids his daughter and the porter to set sail in search of the poison’s antidote. On their quest, the unlikely duo form a reluctant bond as they encounter good and evil genies, daring swordfights, magic boats and flying carpets. But can Sinbad and Ittifaq defeat the sorceress in time, or will their beloved city be destroyed forever? Recommended for ages 9 and older. Evenings: 7:00 p.m. Friday, April 8 only. Experience 500 Clown’s signature mix of high physicality, raw emotion and powerful storytelling with content accessible to an all-ages audience. In 500 CLOWN NOSE, three clowns stumble into a quagmire and soon find themselves jailed in a barren landscape. Their attempts at escape encompass slapstick mishaps, vaudevillian turns, clown acts and daring physical feats. Their desperate search for a way out relies on ingenuity and resilience. When they find the exit, freedom comes at the price of leaving the fun world they’ve created. Featuring 500 Clown founder Adrian Danzig with Timothy Heck and Lea Pascal. Tickets for all shows are $17.00 for adults, $12.00 children aged 14 and under, $10.00 previews and $8.00 school groups. Other group discounts available. Passport to Adventure subscriptions are available beginning in mid-September. For tickets or more information, call (773) 342-4141 or visit www.adventurestage.org. 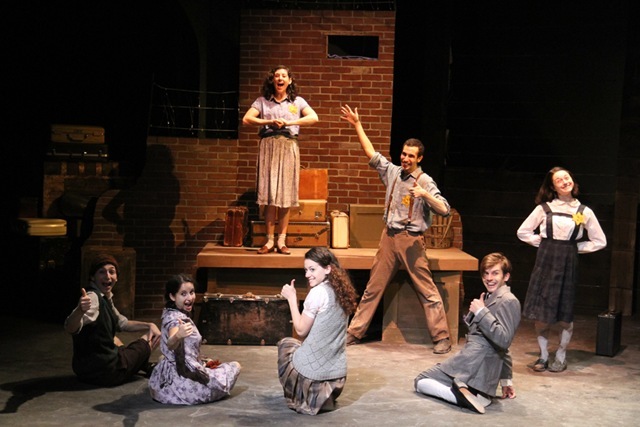 Each Adventure Stage Chicago production presents weekday performances primarily for school groups, as well as weekend matinees for the general public. Every performance includes a post-show audience talkback with the cast.